Two fabulous fingerstyle players with an array of styles on the same bill. One a “Slack Key” guitar specialist and the other a fabulous fingerstyle/slide guitarist who melds the two seamlessly into fantastic arrangements. Slack Key” means that some of the strings on a guitar are slacked from standard tuning, with the bass, melody, and improvisation played at the same time, and is often played to accompany traditional dance or song. Many players use their own special tunings that often remain proprietary secrets. Tonights show will feature this unique and beautiful style of playing. 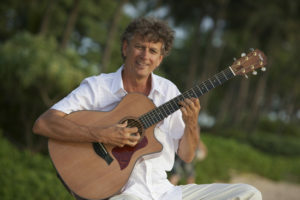 Jim “Kimo” West first visited Hana, Maui in 1985, after a long summer on the road as guitarist for famed musical satirist, “Weird Al” Yankovic. As the sounds of Gabby Pahinui, the Sons of Hawai’i, Sonny Chillingworth, The Sunday Manoa, and others, played on the turntable, he jammed along for fun and relaxation. Already a devotee of open tunings, he was immediately drawn to the gentle rhythms of ki ho ‘alu (slack key guitar) and soon began writing his own songs. The rich physical and cultural landscape of the Hana Coast has provided the inspiration for many of his compositions. While always retaining the heartfelt essence of traditional slack key, Jim “Kimo” West brings much of his own musical heritage to his original ki ho’alu instrumentals. His style can best be described as “nahenahe”, meaning “soft, sweet or gentle voice”, a fusion of old and new but still rooted deeply in tradition. Jim lives in Los Angeles where he writes and produces music which has appeared in feature films and TV shows on all the major networks and cable channels. Plus on the same bill Mark Leggett, an artist who spends most of his time doing film scoring, making a rare appearance performing his original tunes and arrangements. 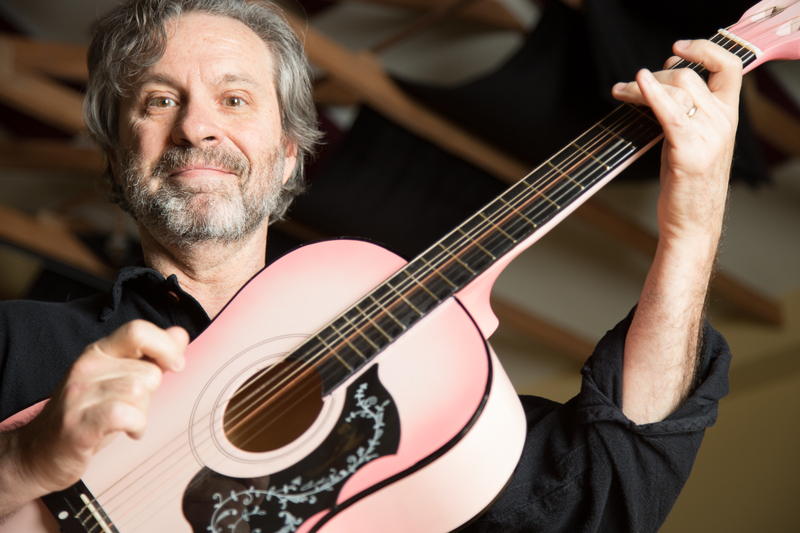 Mark will be playing his fingestyle/slide arrangements of original and classic tunes. Twice Emmy nominated for his composing work, Mark has written music for Levon Helm and The Band, Dolly Parton’s films, the tv show My Name is Earl, and many others. We recently saw Mark perform at the Wiltern Theatre opening the show performing 3 songs solo for a screeening of Easy Rider done with a fabulous live band performing the original songs and incidental music accompanying the dialogue instead of the pre-recorded original songs and music. Mark’s arrangements of the three songs lead to the inevitable, this guy needs to be heard and discovered by more people. A fantastic tasteful player. Don’t miss him.